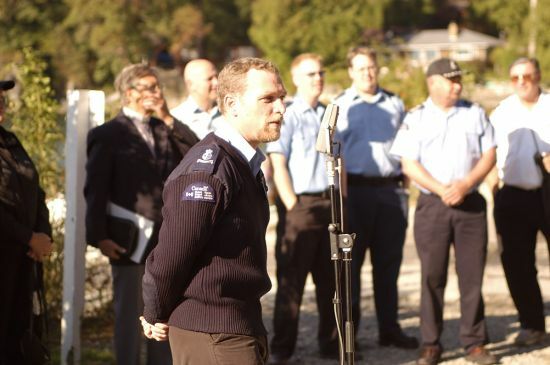 At Coopers Green in Sechelt on Sept 17th 2005 we were finally able to formally dedicate the new Canadian Coast Guard Auxiliary - Pacific Rescue Vessel. Although Kellei and I have only been in the unit for 2 years people have been working towards this for longer. Many events, research, applications, and vast amounts of volunteer time have all come together to make this a reality for us. I´ve gone on About how cool the Boat is in previous posts - so I´ll talk more About how cool it was to actually Hold the ceremony here! we had visitors up from Gibsons, How Sound, Pender Harbour, Powell River, and Victoria. The Sale from Merry Island was tons of fun - and we raised over $600 there and $200 with a 50/50 draw to help pay for the Boat (we still own About $16K of the total $160K) and considering that had it not been for the 50/50 and the donation of the Merry Island items we would have lost money - that was an awesome turnaround. The best part though - was giving the rides - for the first time we were able to take people out in rides in the Boat (because we own it now) and what an amazing effect it had! I even got to take my mother out (made her get in a cruiser suit and everything!) - She loved it. Kellei and I did most of the rides and Tim took out several more. All with a glorious sunset in the Offing and a flat calm cool day - perfect - if it wasn´t I couldn´t have asked for better.